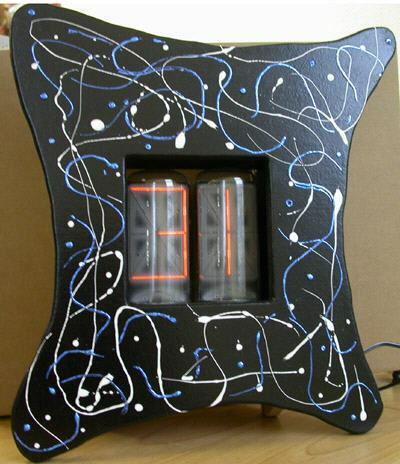 2 tube clock using ZM 1040 or Z566M tubes in a beautiful wooden case. The fading is done by 50 steps pwm. The fading is very soft and looks amazing. Measurements of the case 180 x 180 x 55 mm. Here is an animation of the clock's fading. 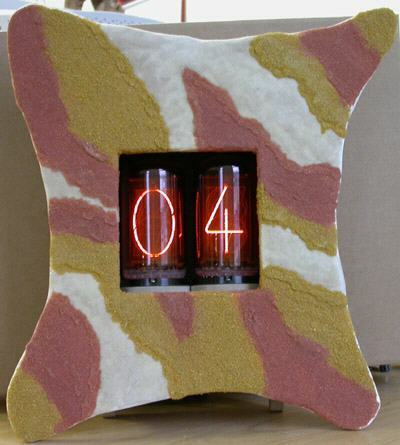 This clock was developed by Chris Barron, one of my friends from Edinburgh. To set the time, enter menu 98. 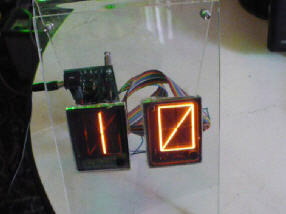 The first pair of digits to be set is the Hours, Note that these are only set in the 24hour mode. Turn the input wheel to select the right hours and press the button to confirm. 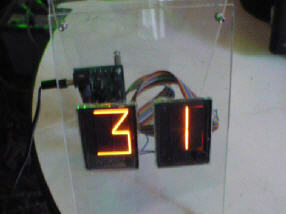 The next digit pair is the minutes, use the wheel to set them as for the hours and press the button when they are correct. The last digit pair is the current seconds, which will be incrementing. If they are correct and you do not wish to reset them (say to synchronize your clock) just press the button to return to the main menu options. Otherwise, turn the wheel at the appropriate time to reset the seconds to zero. 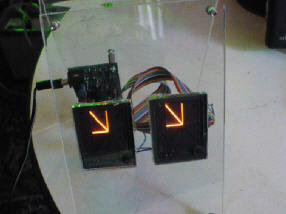 Turn the wheel clockwise (viewed from the front) to alternately switch on and off the tubes, anticlockwise to turn off and on the Leds. 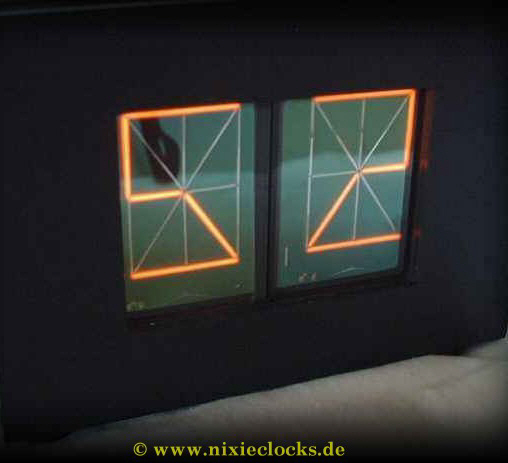 Here is a the documentation [5 KB] of the clock. Telefunken´s answer to the B 7971. This alphanumeric tube is unique in Europe and as far as we know there was no such design in the States either. And as it is a flat design (glass-ceramic) it is offering a lot of possibilities for the designer. 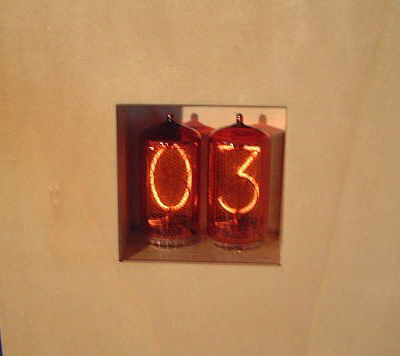 You can use my nixie clock kit for these great tubes. 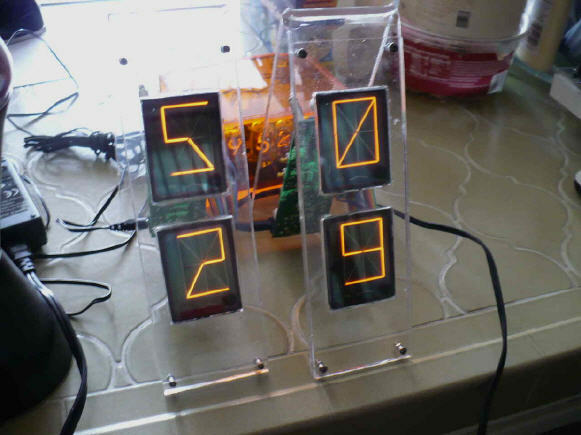 Just connect the pins on the tubes with the pins related to the pcb, very easy and you have your 2 digit designer clock. Further down you will find more info for this tube. If you are interested in those tubes, please check Jan Wuesten’s page. 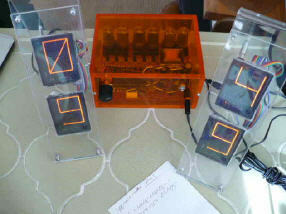 Here are 2 clocks by D. Baum from Berlin. He made a very nice case. The first 2 show the 7971 the other one the giant Z568M by RFT.